Mozilla just pushed out the stable channel of Mozilla Firefox 8, World’s leading web browser.Mozilla Firefox update is around 6.8 MB in size and Mozilla already pushed out the automatic update for all clients world wide. If you want to download a fresh copy you can do it from the link that we shown below this post. 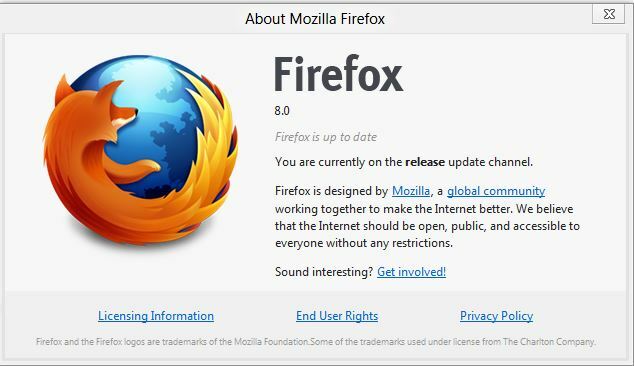 This Mozilla Firefox version 8 update is now live for Firefox for Android, Windows, Linux and Mac operating system. This Firefox updates brings some new exciting features that make Web browsing easier and give users and developers more control over how they customize their Web experience. The main attraction on Firefox 8 includes the addition of twitter on the search option. Twitter search integration on Firefox will help users to find new topics #hashtags and @usernames in English, Portuguese, Slovenian and Japanese versions of Firefox. Mozilla will soon add more language support in future releases. Firefox for Android also added some enhanced features. Now with Firefox Master Password, you can protect all your saved usernames and passwords on your android device.Firefox for Android also added icons for your bookmarked websites and web applications to your android home screen to launch it with one touch. Download Mozilla Firefox 8 From below links.